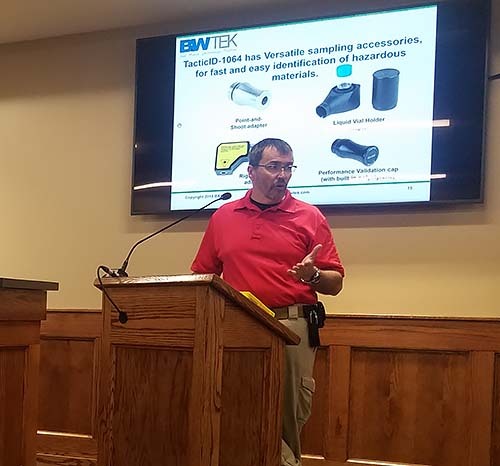 Clint Anderson, Southeast Director for Safeware Inc.
Before the Pickens County Board of Education Work Session on Friday, April 12th, Clint Anderson, Southeast Director for Safeware Inc. gave a presentation on the TacticID instrument that uses Raman spectroscopy, allowing users to get real-time identification of an unknown substance. The cost as of date of video is $43,831. The Pickens Sheriff's Office attended the meeting as well. More on Raman spectroscopy on the BWTEK website.